SILENI [eye-lee'neye], or SILENOI (sing. : silenus, silenos), a race of half-horse, half-humans, unlike the satyrs, who were half-goat. Sileni are sometimes identified as older satyrs more interested in wine than chasing nymphs. Comparative mythographer Joseph Campbell identifies certain repeating characters (archetypes) of the hero myth in his classic book Hero with a Thousand Faces. Silenus is the easiest to identify as the wise old man the others, young hero, the shape-shifting woman, and the shadowy nemesis, also play central parts in the story of Dionysus. Silenus also talked of the Meropes, owners of many cities, saying that on the edge of their land there is a place named Point of No Return, this being a chasm which is neither dark nor light but is covered by a red haze. In this place, Silenus continued, there are two rivers, one named Pleasure and the other Grief with trees along the banks of both that bear fruit of different qualities. Those that grow along the river of Grief cause anyone who eats them to shed so many tears that he melts into laments for the rest of his life until he dies. But he who tastes from the trees growing by the river Pleasure loses all his desires, forgetting even his previous love, if he had one. Then he is slowly rejuvenated, going through the stages of life in reverse order and dying after becoming an infant. 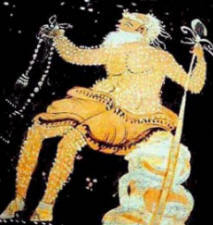 Silenus , the teacher and faithful companion of the wine-god Dionysus. 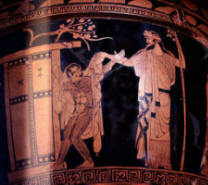 A notorious consumer of wine, he was usually drunk and had to be supported by satyrs or carried by a donkey. When the Phrygian King Midas took the drunk Silenus in his house, Dionysus handsomely rewarded Midas for his hospitality. 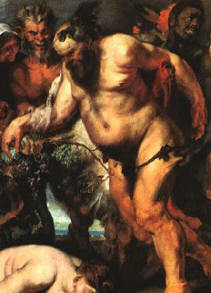 Silenus was thought to have much wisdom and be able to reveal important secrets to mortals if captured and questioned. He is considered a satyr but associated with the stature of older men in the ritual and mentoring necessary for initiation. But the goddess was not deceived, and in her rage she drove the aunt and uncle mad. 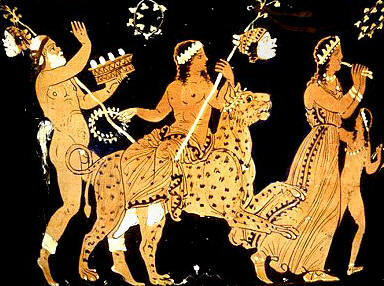 Dionysus temporarily into a young goat and bring him to the beautiful Mount Nysa. There he would be raised secretly by nymphs, the joyous female spirits of the forests and mountains. The nymphs loved their young charge. They housed him in a cave and fed him on honey. Dionysus spent his childhood gamboling freely over the mountainside, surrounded by the glories of nature and learning the sensuous pleasures of the earth. His teachers were many and varied: The Muses inspired him with poetry and music. The satyrs, half-man, half-goat, taught him the wonders of dance and exuberant sexuality. The sileni, part-horse, part-man, spirits of the springs and rivers, taught him wisdom. 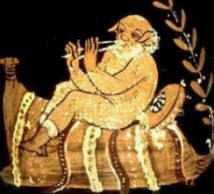 Silenus, the intoxicated old man who was Dionysus's predecessor, taught the young god virtue. Dionysus passed the years happily, learning many things. Like the grapevine, which can only grow in the sun's intense heat and the moisture of the spring rain, Dionysus had been born of fire and nourished by the rains of the mountain. He understood the power of the vine perfectly, and marked his passage from childhood to young godhood by inventing the art of winemaking (some say he learned it from Silenus), which would bring humanity so much potential joy and desperation. At last Dionysus stood revealed as a god. This was just what the ever-vengeful Hera had been waiting for. 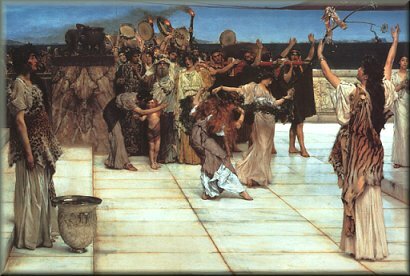 Recognizing Dionysus at last, she cursed him with madness.